Rig-a-Jig-Jig! is a highly acclaimed, fully illustrated book with a companion CD. This superb kit contains a great collection of dances, musical games and other activities for younger children. This highly successful kit from Bluegum Music has become an indispensable tool for every early childhood teacher and is recommended for play-groups, kindergartens, pre-schools, and early primary school. It has also become a favourite with parents and anyone trying to entertain children aged 3 to 8 years. In Rig-a-Jig-Jig! 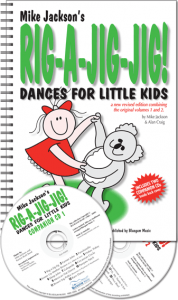 we present an excellent and varied selection of musical activities with all the music needed for each dance performed by Mike Jackson and friends on the companion CD. The music on the CD is presented in a ‘learn as you go’ style which both teachers and parents will find easy to use and great fun! Produced by Bluegum Music, Brisbane. 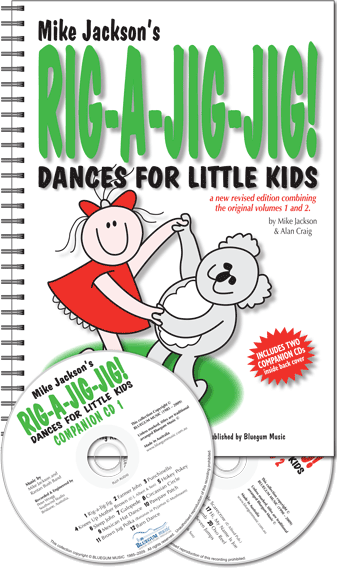 Contains ALL the dances from Dances for Little Kids 1 and more!